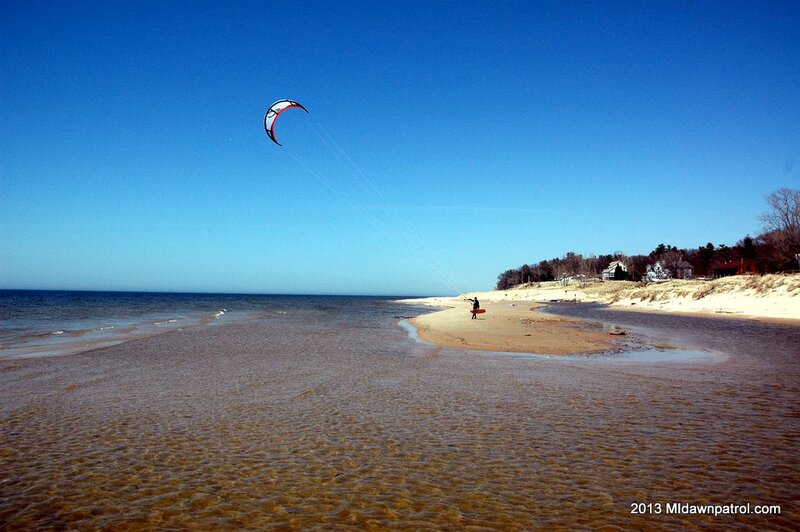 There’s a lot of great kiteboarding in West Michigan but no location has more wind more often than Little Sable Point. Yesterday the forecast for West Michigan was dismal at only around 10 knots. Farther north around Big Sable Point the kiteboarding forecast looked slightly better. With the sunny skies we were hoping for some thermal wind action so we decided to head north on US31 and make a “gametime” decision whether to hit up Big or Little Sable. As we approached the Shelby road exit around 1:00, Big Sable was showing around 15 knots and the LSP wind meter was only showing around 10. Having been skunked several times at Big Sable we decided to go with our guts and Little Sable Point. As Silver Lake came into view we weren’t seeing many signs of wind, but as we made the turn towards the point we noticed some tree branches swaying and as we passed by the first Lake Michigan inlet we could see rippling water and white caps. This really got me excited since I had pretty low expectations of having enough wind to go kiteboarding based on the wind readings we were seeing.We arrived at the parking lot, hopped out of the car, ran past the lighthouse, and once we saw the water we knew it was on! While rigging up we checked the handheld windmeter on the ground and were getting readings around 14 knots with blowing sand. I rigged up my 15 meter kite and Jetty started out on his 8 meter. The wind had died out a few knots by the time we got on the water but it was enough wind to stay up wind and go for some light jumps. After an hour and a few walks up the beach with my kite I decided to take a break and catch some video of Jetty. Jetty had noticed that the stream that outlets into Lake Michigan north of the lighthouse was higher than normal due to all the rain we’ve been having so he decided to try and kiteboard on it. The wind was pretty light by this time but he was able to travel up the stream for around 50 feet. You can see him hit the stream in the video below. Another location like this with a wider stream is Duck Lake State Park which we plan to ride sometime in the near future. All in all another great day of kiteboarding at Little Sable Point. Kiteboarding Little Sable Point from Michigan Dawn Patrol on Vimeo. great website and keep the good photos of the kiting action coming! Thanks! Definitely was a great time on Saturday. Hoping to get out tonight if the wind holds!! !